A musician’s music touches and elevates the Soul of the Singer as well as the Soul of the Listener only when the “Soul of the Singer” connects with the “Soul of the Raga” firstly, then with the Soul of the Sahityam, then with the Soul of the Devatha ” in that krithi. When everything is aligned and in perfect communion, there is nothing but absolute” Bliss”. This is my direct experience as a listener when I visited a temple and saw an aged Mami who was singing with utmost devotion in front of Goddess Saradambal at Kalady Sringeri Sarada Temple, located in Kerala. This Mami was not a celebrity nor a great musician. But her song about Saradambaal in Raga Yamunakalyani was flawless and perfectly in tune with the sruthi. She was leaning on a pillar and sitting there with closed eyes contemplating on the Goddess while she was singing. She seemed to be an ordinary housewife who would visit the temple everyday as a ritual to see the Divine Mother and get HER blessings. I silently sat behind her and closed my eyes too to contemplate on Goddess Saradambaal. The music was over in 6-7 minutes and she turned back to hold the pillar for a support to get up when I offered her my hand to slowly getup. I saw that Mami’s eyes were welled up with tears of happiness which anyone could sense. Those were not the tears that came out due to the outpour of her sufferings, complaints and disappointments to Ambaal. It was tears of delight and ecstasy. I told her that it was a divine musical experience for me as well, as my eyes tempted to spill. She was not distracted about the surroundings or the tourists who were making a lot of noise inside the temple as if they were visiting a mall or theme park. [This is atrocious !! ] . The tourists left the place quickly (thank GOD). Now let us see how this so called BLISS is transported to the listener. Let us visualise Mami who is completely lost in her Divine Sangeetham. She reached out to the Raga and contemplated first on the Raga Devatha and in a matter of few minutes she was in perfect union with Raga Yamunakalyani. Then she started singing the krithi in a slow pace which best suited the Misrachappu Tala of the composition. Music started flowing. Abudndantly blessed by the Raga Devatha, she slipped into Alap once again while singing the first line of Anupallavi bringing all the vibrant colors and emotions of the raga such as bhakthi, saranagathi (surrender), santham, etc which may be ruling her mind at that point of time. I felt that atmosphere was charged with the positive vibrations of this flowing melody. It is said that every object in this world has a Soul. Soul is not just for humans or living things. 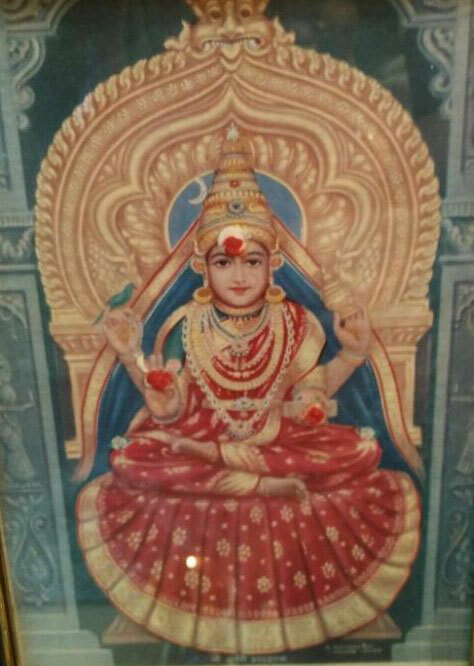 What I have inferred is, Mami’s soulful sangeetham first connected with Ambal’s Soul in the Sanctum, then it connected with the Soul of the atmosphere or the Soul of the Prayer Hall in front of the Sanctum, to all the pillars, to the Soul of the Trees, Cows and Birds on the premises and several other things in the temple including the Homa Kundam and last but not the least, it got connected with me too a humble devotee of Saradaambal who was in rapt attention listening to the divine vibrations of Nada. Every soul of the object or person (if he/she listened to Mami’s singing) in the prayer hall were elevated to the heights of divine ecstasy and delight. There was no amplifier or mike. This divinely and musically charged atmosphere was all connected as if through WIFI. We further infer that, when a Sangeetha Upasaka sings ONLY FOR GOD and FOR THE LOVE OF ART, amazingly, he/she gets connected to other Divine Souls with similar outlook. The Heaven and Earth conspires to bring such Souls together. It is as though these like-minded Souls which are trapped inside the human body, separated geographically, establishes contact through the divine power of the Universal Soul, without their effort or knowledge. This would have happened for any selfless lover of the art form that he/she has taken up in and for their life. It was just co-incidental for me to visit the temple that particular day. But the Universal Power conspired everything in such a way that, it appeared that, though my visit to this temple was totally unplanned, IT WAS ALREADY PLANNED BY THE SUPREME POWER – by making something that I had planned go wrong.! Now I realise that the Supreme Power is so KIND, that it was for my good that my plan failed and Saradaambaal showed me an alternative path. It was as if Mami was waiting for me to begin her singing, though she never saw a person coming or sitting behind her. I was there just to listen to this divine rendition and to learn and observe how to contemplate and attain the eternal bliss while singing and while listening. Mami’s Soul attracted my Soul and Ambal’s Soul conspired to make it happen. ! A person who is walking on the hot sun feels to go and stand on the shade of a big tree nearby, only when the Soul of the Tree attracts the Soul of the man to come and stand, so that it can be of service to him.! This is just a small example of learning from Nature. This is what the Nature teaches us.. BE SELFLESS AND BE READY TO SERVE ALWAYS !! One last thing, I would like to mention here is all musical instruments Veena, Venu, Mrindagam etc – every instrument is divine and has a SOUL and here is a request never to keep it locked up in a glass case as a show piece in your drawing room or filled with dust and dirt due to non-use !! I chanced to see a Veena and a Mridangam like that in a friend’s home. Veena is Divine. It is Goddess Saraswathi personified.. Blessed to learn and teach SANGEETHAM. Pranaams to my Parents and to my Gurus who showed me this way..
My eyes filled with tears and the raga still rings my ears. Beautifully articulated.I am sure you would have been moved to write this wonderful piece.Divine, soulful music has that power.Blessed you are! It was touching to read this musical experience. Carnatic Music was always intended to be a sadhana to reach the supreme being for an individual who is on a spiritual journey. Such a sadhana has now sadly been reduced as a means for attaining materialistic end. I had removed it from spam folder I will continue to read your wondrrful blogs. Rightly said. When the singer, song & listener are in tune, there is perfect harmony & divinity. That is why compositions of our Vaggeyakaras when sung in right spirit elevate us to an entirely different plane. Very nice, any recording of the song.